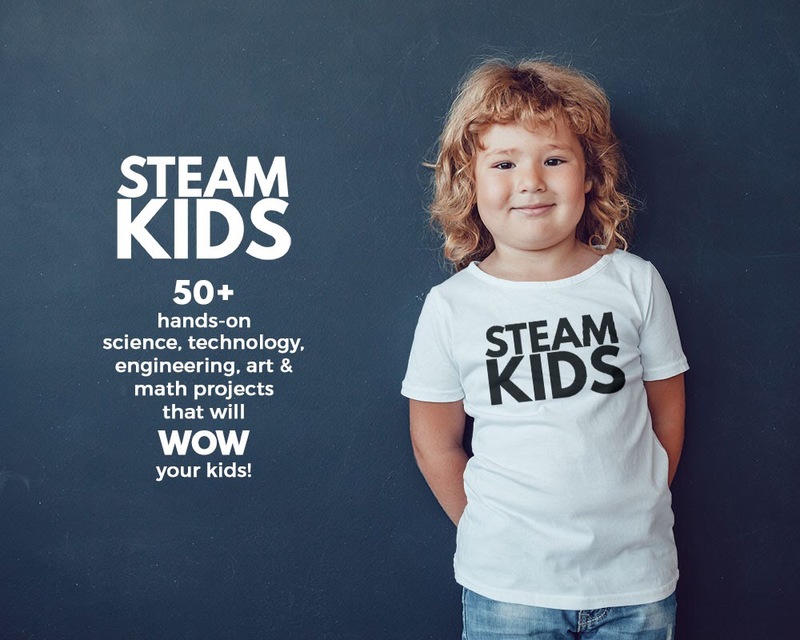 Do you have a STEAM Kid? Not yet? We know you have lots of questions about STEAM, and we are here to help. How do I get started with STEAM? Do I already have STEAM materials in my home? How can I acquire STEAM materials on a budget? How do I teach STEAM? How do I adapt STEM and STEAM for different children? What are some good STEAM projects? How can I help my child not give up? How can I help promote out of the box thinkers? I don’t know about your kids, but when my two boys get bored, they fight. Even when a commercial interrupts whatever they’re watching, they fight. So I spend a lot of time setting up invitations for them to create. This really seems to help them focus on fun, educational things, and this occupies them, so they aren’t wrestling or crying. STEAM Kids gives you 50+ projects we’ve come up with. That’s a year’s worth of captivating STEAM activities that will wow the boredom out of kids. It is perfect for children ages 4 to 10. The step-by-step activities are helpfully coded with difficulty indicators and estimated project times. Suggested project extensions promote further exploration and learning for enthusiastic children. The bonus materials will make things easy for parents and educators. They include: a handy weekly planning guide, project shopping lists, a STEAM journal, and more. We have it all laid out for you to make bringing STEAM to the children in your life simple and fun. Being an art teacher, I obviously love art and have a big focus on the A in STEAM. But what I’ve learned over the years is that you can keep the kids really interested (especially rowdy boys like mine) by throwing some colorful explosions or tinkering in there. Do that, and you’ll have a captive audience. I integrate science, technology, engineering, and math into my art projects in such fun ways that the kids don’t even see it coming. They think they are playing, but they are learning the whole time. I sound pretty sneaky, don’t I? That’s fine, because it works…and in a good way! Our book is broken down into several project-type sections: build, color, grow, play, sense. So you will be getting a little bit of everything, from stop-motion, grow experiments, exploring the senses, to bottle rockets. The kids in your life will be hooked on STEAM even if they don’t know what it stands for. If you are a part of our STEAM Kids Facebook Group, you know just how many ideas you can with your kids with just a few materials at home. You don’t need expensive materials, you don’t need brand new fancy science kits. You don’t even need very many items at all. We have put together some really fun gifts for you if you get the complete guide the first week! We decided a special launch price would be really fun! In fact, you can get the full color PDF download today through next week for only $9.99 (a $5 savings). But that is NOT ALL! We are adding in A FREE E-BOOK with ten awesome STEAM Halloween Projects just for you! We have made this special download FREE JUST FOR THIS WEEK ONLY! We came up with super engaging and simple projects that would make it easier to beat boredom, tools that would help you share your child’s love for science, and gifts that would enhance the power of learning with STEAM!